MØRLAND is artist, songwriter and producer. Kjetil Mørland comes from Grimstad, but has lived in England for most of his adult life. This has had a major influence on him as an artist and songwriter. His music is clearly inspired by British popular music, and Kjetil's strength lies in his clean-cut and catchy melodies and close personal lyrics, which he conveys with a distinctive voice. The Shins, David Bowie, Elton John and early Talking Heads, and obviously Lennon / McCartney are some of many inspirations. 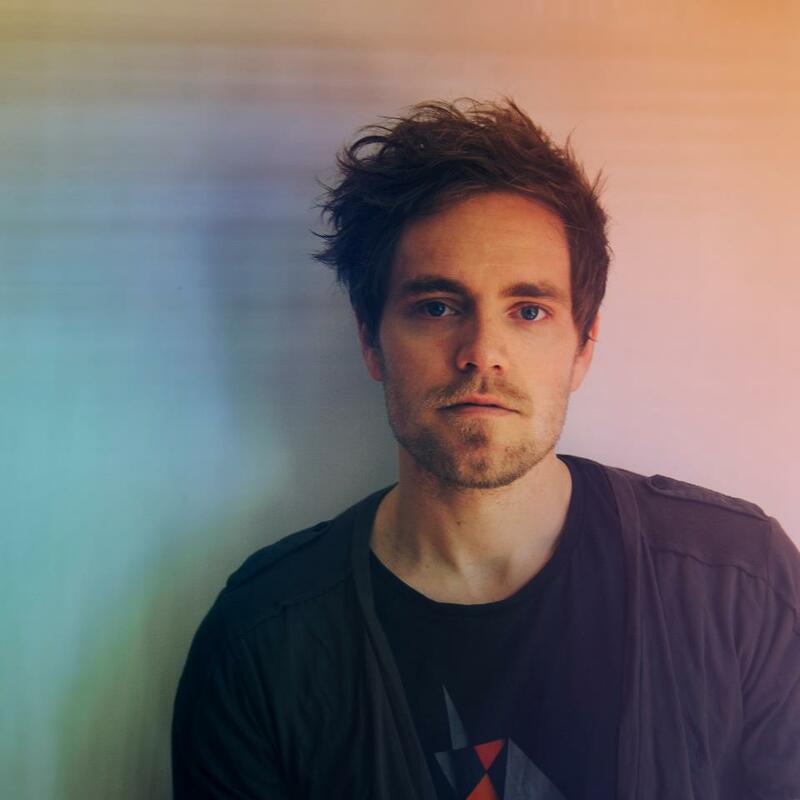 With his British band Absent Elk Kjetil has released the album 'Caught In the Headlights', with Toby Smith (Jamiroquai) accounted for production. The singles 'Sun & Water' and 'Emily' got both playing on national UK radio and the band guested also at the popular talk show of Dermot O'Leary, where they have performed acoustic live versions of their songs. Kjetil and Absent Elk received much attention after making a cover version of Lady Gaga's 'Poker Face'. YouTube video got in short time nearly half a million views. The band also made a cover version of Girls Aloud 'The Loving Kind', and was invited as the opening act on their tour in the UK. The band has also supported such acts as Keane, The Script on their tours. Kjetil moved to Oslo last fall to establish himself as a solo artist, and works these days on his first solo album, which is scheduled to be released in 2015. 'A Monster Like Me" is a dark love ballad written by Kjetil. It's about confronting something unsettled from the past, and having to let go the one you love. With him on the track appears Debrah Scarlett. "I remembered Debrah Scarlett from a TV show from last year and that I really liked the character in her voice. I had a good feeling she would suit the song very well". The Norwegian-Swiss girl lived in Noida until she was five, but has spent most of her adolescence in Switzerland. She was born into an artistic family that gave her a multicultural point of view. Debrah has been playing music around Switzerland with various artists, mostly with jazz-musicians she was acquainted through jazz school in Basel and was composing beautiful melancholic songs between jazz, neofolk, soul and funk styles. 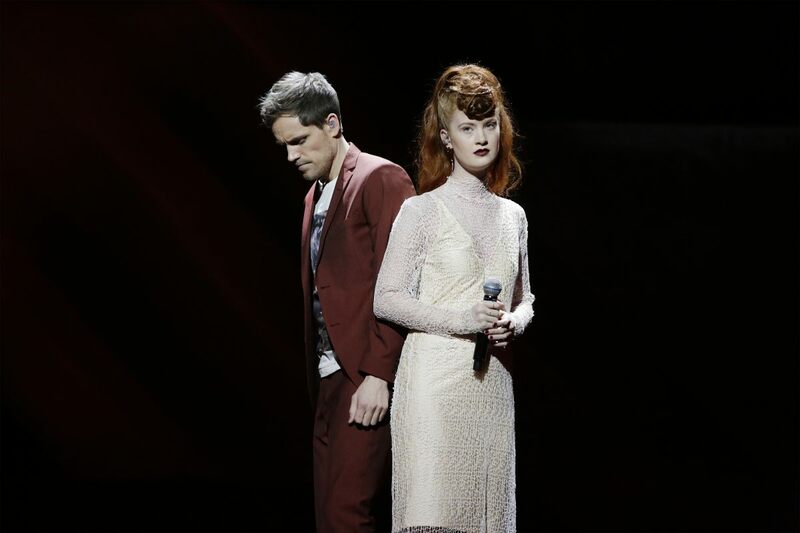 In Fall 2013, Debrah (performing under her birth name Joanna D. Bussinger) made an impression on many Norwegians with her distinctive voice through participation in "The Voice" on TV2, making it to the semifinal stage. Since then, she has played a number of concerts in her two homelands. Back in Switzerland she was asked to join project called “The Rumours”, that involved 13 artists from completely different genres finding one style on one stage, which released an album and toured between October-November 2014. In Fall last year, she moved back to Norway, and now hoping in earnest to start a music career there. "I woke up being sick in bed with a cold on tour, when a stranger SMSed me and asked if I'd like to join him in the competition. At first I was a bit sceptical, but made up my mind as soon as I heard the song.". Prior to the national final, the duet has also released cover version of Alexander Rybak's winning entry Fairytale. "The song lyric is about facing up to a mistake from the past, coming to terms with who you are and what you have done, but also coming clean and moving on as a stronger person. We all make mistakes, some more serious than others, and for some people bad memories and regrets can build a wall around them that stands to isolate them from the ones they love and care about. The lyrics are very open to interpretation, and it will be interesting to see what people feel when they hear the song. The song was written as a monologue despite being performed as a duet." 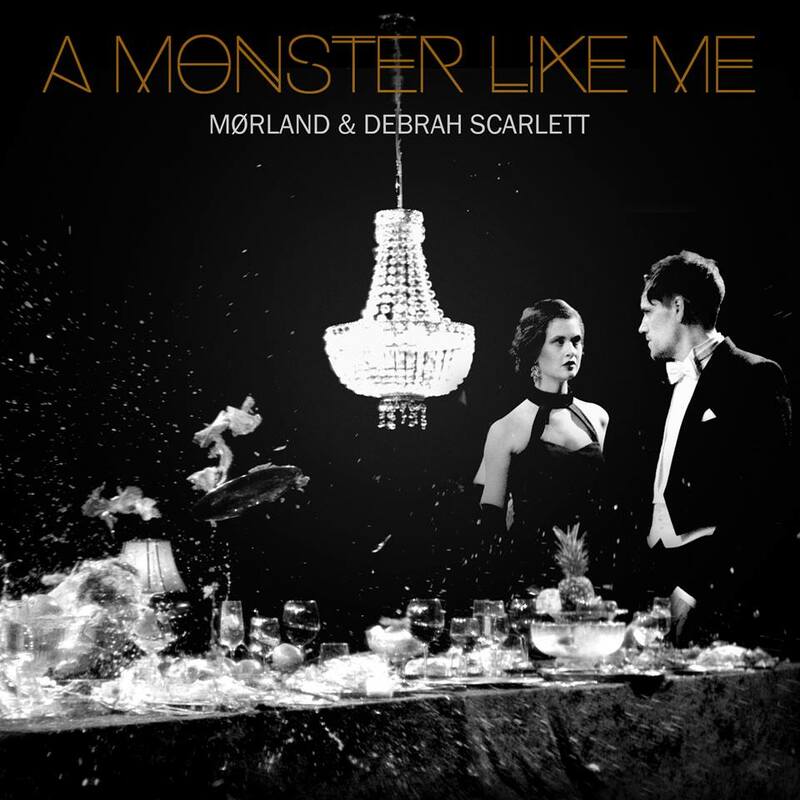 At the Eurovision Mørland & Debrah Scarlett will perform song "A Monster Like Me" which the describe as "a dark lovesong about an untold secret and not feeling worthy of love". Kjetil explains that the song wasn't specifically aimed for Eurovision. "I couldn't write music like that. It has to come from the heart. It's a song I've had lying around for a while. It's one of those songs that just came out of the blue - I wrote it really quickly. I got the strings recorded in London when I lived over there. A friend of mine knew about this 'secret' studio that very few knew of, but many well known artist had recorded because of the great room sound and atmosphere. It didn't take long for me to produce it after the string were recorded – they really defined the track". 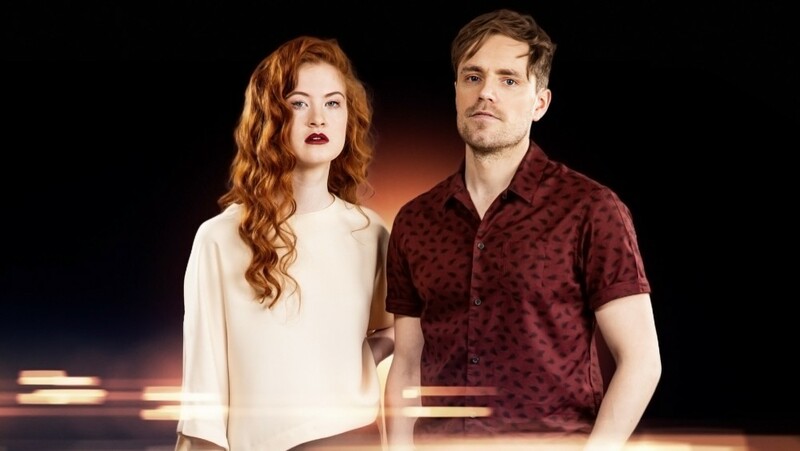 The next step was to find a right partner for the performance: "I had seen Debrah Scarlett in a TV show the last year and I really liked the character in her voice – she really suits the mood of the song"
The duet has already presented music video for their song: "The idea was to really reflect the cinematic feel of the song. We wanted something different to the many undersaturated music videos out there. As you may have noticed, we poison the guests at the start of the video which is why it all goes a bit crazy towards the end. The idea was a nod towards the wrongdoing in the lyric. But generally we didn't want the video to have much of a chronological story and rather leave it up to the viewer to interpret and leave some mystery – much like the song itself. After the national final there was discussion about using of KORK orchestral arrangement of the track, that was performed live at the MGP at the Eurovision itself. Unfortunately it will not happen and Kjetil explains it saying: "There was too much vocal bleed on the string recordings from the performance so we weren't allowed. Eurovision are very strict on not including any vocals on the backing track". He also says that he has been toying with doing a more electronic remix of the song after the show, but specifically adds that it has to be atmospheric and classy suiting the song mood, not a cheap house remix. At the moment Norwegian team is working on the stage presentation of the entry for the big Eurovision. Everything is being worked as a collaboration between performers, NRK team and Eurovision stage team, and there will be some changes, or rather improvements compared to the national final. "There will be some backing singer doing the ooohs in the mid 8 (as we can't have it on tracks), but I don't think they will feature in the stage performance", says Kjetil. Norwegian artists say that their main goal at Eurovision is to connect with each of the 200 million people watching. They will be visiting several pre-Eurovision concerts in April, but do not know if that will really impact the result. "We think it all hangs on the night and the performance, they say. At the moment they haven't yet heard all other competing entries, just the few of them. Besides Eurovision preparations Mørland is currently working on his debut solo album. "I have my own studio in Oslo where I spend most of my days at the moment (when I'm not doing promo stuff like this) producing my first solo album. I'm very excited about it. It's taking shape and I've written a bunch of songs I'm really pleased with. Genre-wise I guess it's very British pop inspired – as much of my music is. I've lived in the UK for so long and also grew up listening to British music – so it's in my bones". 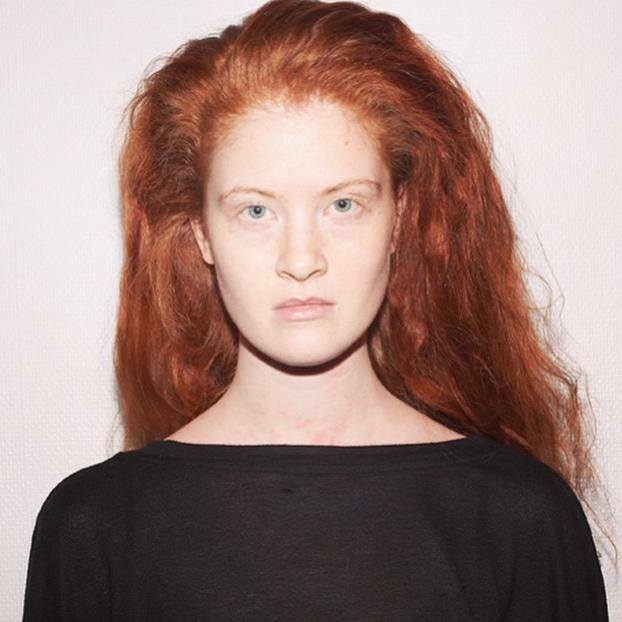 From her side, Debrah says that she is also working on her music with two very talented musicians in Oslo. "My plan would be to release my self composed songs and publish some singles after Eurovision. Mørland and I are also planning to do some concerts during the summer, where we will combine a setlist that will have some of his songs and some of mine. After that, we will see...". Will there be more duets? "Maybe! We haven't discussed it yet, but we'll see – watch this space!. "Hello guys! Hope you enjoy this years Eurovision. We'll do our best to impress you. If you like our song, feel free to follow us on Facebook (Mørland, Debrah Scarlett), Twitter (Mørland, Debrah Scarlett) and Instagram (Mørland, Debrah Scarlett)"
You can read the complete text of the interview on OGAE Rest of the World Facebook page. Med fire korister som aldri har sunget sammen før, var alle litt spente før dagens første prøver. Men dette gikk over all forventning. Bring it on, Vienna! NRK will again be airing this year preview show "Adresse Wien", where a panel of celebrities will review various entries taking part in the Eurovision Song Contest this year. New presenter of the program is former panelist Tarjei Strøm, drummer of Datarock. This year "Andresse" will be aired in 4 parts, starting Saturday, 2 May, at 19:55 on NRK 1. This year's panelists are: Tor Endresen, participant of several Eurovision Song Contests and national selections, Bertine Zetlitz - Pop-singer and songwriter, Ingeborg Heldal - teacher and journalist for side2.no, Vivi Stenberg - MGP music director, who will be leaving the job after the season, Linda Eide - writer and journalist, Gisle Stokland - editor and owner of entertainment website 730.no. Watch show in archive: 1st show. Watch the video from filming of 2nd part of Norwegian postcard in Austria here. 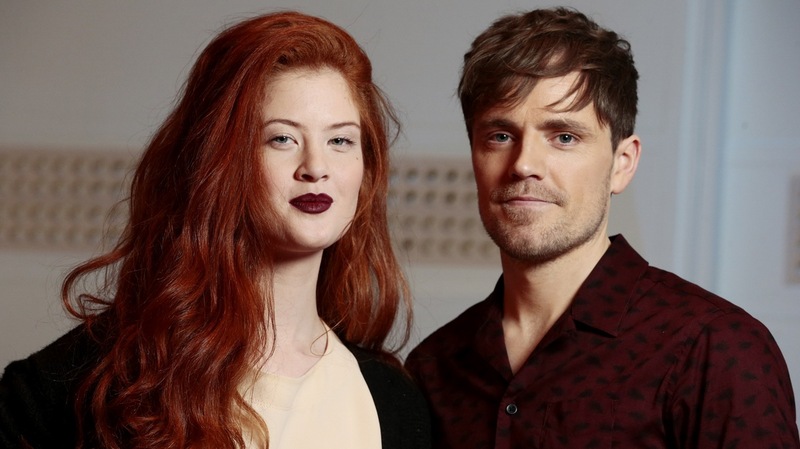 Mørland & Debrah Scarlett have appeared in NRK talk show Lindmo. Among other guests of the show was Swedish sign language interpreter Tommy Krångh. Recording of the show (interviews in Norwegian) can be seen here, starting from 26 minute. 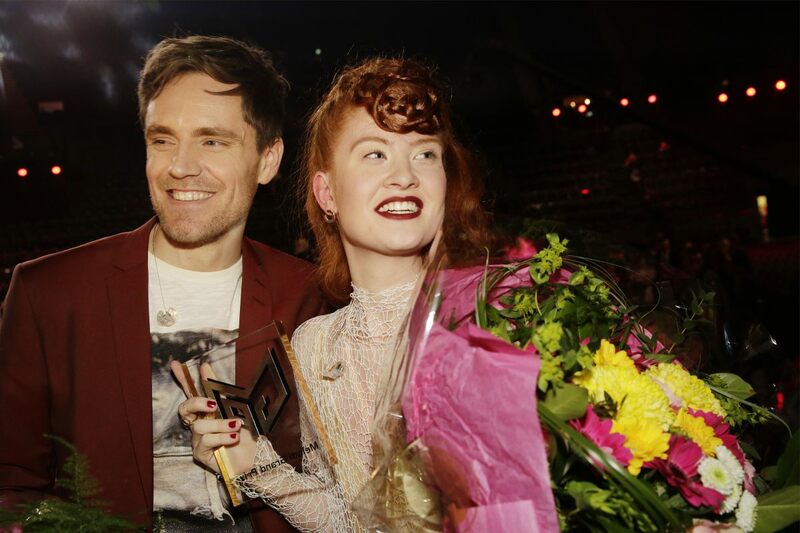 Right after their victory at the national final Mørland & Debrah Scarlett took part in online conference on NRK website. "We will continue working on the presentation. We would keep all the focus on the music. Often, especially in Eurovision context the stage show completely overshadows the main thing - the song. We joined the MGP because we love music and would take the opportunity to show ourselves as artists. The music is always our main focus, but we will try to create a magical appearance for Vienna. We are going to continue to work to cultivate the image we have already created and make it even more clear. We think this may be as effective between all the smoke and glitter that often defines such a show. 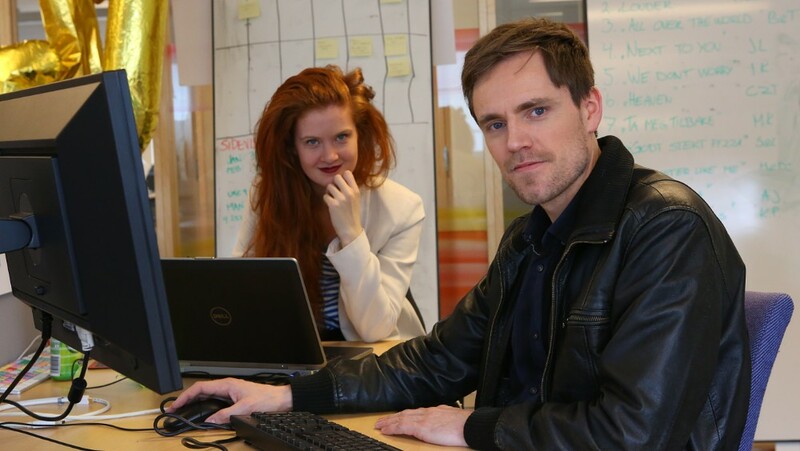 We will have a brainstorm session with NRK this week and we will surely get some ideas!" Among other things it was mentioned that duet would like to get Kork orchestra from MGP final to feature on the Eurovision version of their entry. The answer to that idea will be known after meeting with NRK team on Thursday. It was also mentioned in one of NRK radio shows, that originally it was Silje Nergaard and her husband Heine Totland proposed to perform the song at the MGP, but they have rejected the offer. "There is a great deal of tracks that come from more or less known songwriter environments in countries like Sweden and the UK, as well as some "outlaws" from countries where we know there is great interest around Eurovision, such as Australia and the USA. The percentage of songs that fall into pop / electronica genre is probably slightly larger than before. 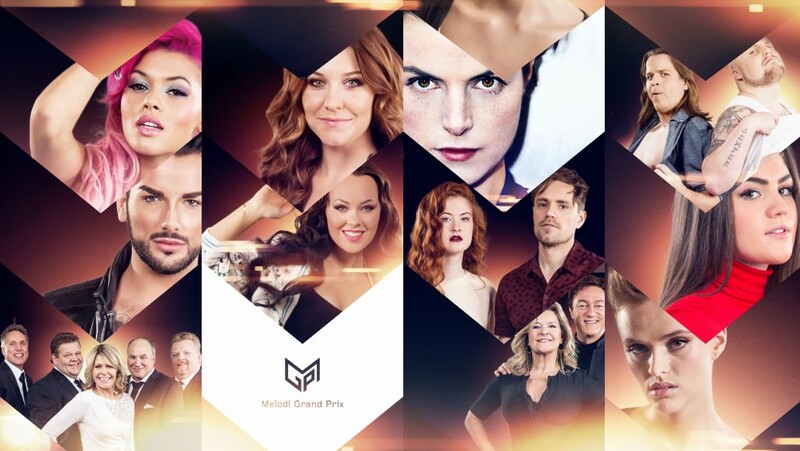 But most of all I am pleased that we have got some of the best songwriters from our own country and exciting new artists"
This year, there will be no jury vote involved in Melodi Grand Prix this year, there will be two televoting rounds, with 4 acts with the highest number of votes to proceed to a "goldfinal". MØRLAND - певец, автор песен и продюсер. Кьетиль Мёрланд родился в Гримстаде, Норвегия, но почти всю свою жизнь провел в Англии. Это повлияло на него как на исполнителя и автора. Его музыка, несомненно, вдохновлена популярной британской музыкой, а сила Кьетиля в его безупречных и запоминающихся мелодиях и личных текстах, которые он исполняет своим характерным голосом. The Shins, Дэвид Боуи, Элтон Джон, ранние Talking Heads, и, очевидно, Леннон / Маккартни вдохновляли его на творчество. Со своей британской группой Absent Elk Кьетиль выпустил альбом 'Caught In the Headlights', спродюсированный Тоби Смитом (Jamiroquai). Синглы 'Sun & Water' и 'Emily' вышли на национальное радио, группа также побывала в популярном ток-шоу Дермота О'Лири, где исполнила акустические версии своих песен. Широкое внимание Кьетиль и Absent Elk получили после записи кавер-версии на песню Lady Gaga "Poker Face". Youtube видеоклип на нее вскоре собрал свыше полумиллиона просмотров. Группа также записала кавер-версию песни Girls Aloud 'The Loving Kind' и была приглашена выступить на разогреве во время их турне по Великобритании. Также группа выступала в турне вместе с Keane и The Script. Прошлой осенью Кьетиль перебралься в Осло, чтобы начать сольную карьеру, и в настоящее время работает над дебютным сольным альбомом, который должен выйти в продажу в 2015 году. 'A Monster Like Me" - темная баллада о любви, написанная Кьетилем. Она о противостоянии каким-то неурегулированным конфликтам из прошлого, и о том, как отпустить того, кого любишь. Вместе с Мёрландом на треке поет певица Дебра Скарлетт. "Я помнил Дебру из участия в телешоу в прошлом году, и мне очень понравился ее характерный голос. Мне показалось, что она бы очень хорошо подошла к моей песне". Норвежско-швейцарская исполнительница жила в Ноиде до возраста пяти лет, но почти всю свою сознательную жизнь провела в Швейцарии. Она родилась в артистической семье, которая привила ей мультикультурное зрение на мир. Дебра исполняла музыку в Швейцарии вместе с различными артистами, прежде всего с джазовыми музыкантами, с которыми она была знакома по джазовой школе Базеля, и писала меланхолинчые красивые песни в стиле между джазом, неофолком, соулом и фанком. Осенью 2013 года Дебра (выступая под своим настоящим именем Йоанна Д. Буссингер) впечатлила многих норвежцев своим вокалом во время участия в шоу "Голос" на телеканале TV2, где она дошла до стадии полуфинала. С той поры она дала серию концертов в обеих своих странах. В Швейцарии она получает предложение присоединиться к проекту "The Rumours", в состав которого вошли 13 артистов, представляющих собой полностью разные музыкальные жанры, объединенные одной сценой, выпустила альбом в его составе и приняла участие в туре в октябре - ноябре 2014 года. Прошлой осенью она принимает решение вернуться в Норвегию и постараться начать свою музыкальную карьеру там. "Однажды, когда я простуженная во время тура лежала в постели, меня разбудила смска от незнакомца, предложившего выступить с ним вместе в музыкальном конкурсе. Сначала я оценила эту затею несколько скептически, но приняла решение сразу же, как только услышала песню". Перед финалом национального отбора, дуэт также выпустил кавер-версию песни Александра Рыбака Fairytale. "Текст песни рассказывает о повторной встрече с ошибкой из прошлого, об осознании того, кто ты есть и что ты сделал, но также и о том, как можно выйти из сложившейся ситуации и стать лишь сильнее. Мы все совершаем ошибки, некоторые из них более серьезные, чем другие, и для некоторых людей плохие воспомимания и сожаления о прошлом создают стену, которая окружает их и изолирует от тех, кого они любят и о ком они заботятся. Вообще текст очень открыт для интерпретации, и нам интересно узнать, что чувствуют люди, когда они слышат нашу песню. Она написана скорее в формате монолога, хоть и исполняется дуэтом." На Евровидении Mørland & Дебра Скарлетт исполнят песню под названием "A Monster Like Me", которую описывают как "тёмную балладу о нераскрытом секрете и о чувстве недостойности любви". Кьетиль объясняет, что песня не была написана специально для Евровидения. "Я не мог просто так написать композицию. Это должно идти от самого сердца. Это песня, которая витала вокруг какое-то время. Это одна из тех песен, которые действительно сваливаются на тебя из ниоткуда - я написал ее очень быстро. Струнную секцию я записал в Лондоне, еще когда жил там. Мой друг знал об этой моей "секретной" студии, о которой вообще мало кто знал, но многие хорошо известные артисты записывались там, в первую очередь из-за прекрасного звука в помещении и атмосферы. У меня не заняло много времени, чтобы спродюсировать песню, после того, как были записаны струнные инструменты, они действительно формируют весь трек". И следующим шагом стал поиск правильной партнёрши для выступления. "Я увидел Дебру Скарлетт в прошлом году на одном ТВ шоу, мне очень понравилась характерность её голоса – она действительно подходит под настроение этой песни". Дуэт уже выпустил видео клип на свою композицию. "Основной идеей было по-настоящему отразить кинематографическую атмосферу песни. Мы хотели что-нибудь другое, чем просто малонасыщенное музыкальное видео. Как вы уже, наверное, заметили, мы намеренно подсыпаем яд нашим гостям в самом начале клипа, что приводит к несколько сумасшедшему концу. Идея несколько соответствует тому преступлению, о котором идет речь в песне. Но в целом мы не хотели, чтобы наш клип имел какую-либо хронологическую историю, и скорее оставили зрителю возможность самому интерпретировать, а также сохранили немного тайны, как и в самой песне". После национального финала имела место дискуссия о том, можно ли использовать оркестровую аранжировку с национального отбора в треке. К сожалению, этого не случится, и Кьетиль объясняет почему: "В записи с отбора нам не удалось полностью очистить звук струнных инструментов от пятен вокала, поэтому нам не разрешили ее использовать. На Евровидении очень строго следят за тем, чтобы инструментал песни не включал в себя никакого вокала". Он также говорит, что у него есть идея создать в будущем электронный ремикс на эту песню, но при этом специально добавляет, что он должен быть достаточно атмосферным и утонченным, а не дешевым клубным хаус-ремиксом. В настоящее время норвежская команда работает над постановкой своего выступления на сцене большого Евровидения. Всё обговаривается между самими исполнителями, норвежской телекомпанией и сценической командой Евровидения. Будут некоторые изменения, скорее усовершенствования по сравнению с национальным финалом. "Будет какой-то бэк-вокалист, который будет делать "ооох" (поскольку нам нельзя это иметь это в записи на фонограмме трека), но я не думаю, что он будет принимать участие в сценическом номере" - говорит Кьетиль. Норвежские артисты говорят, что главной задачей на Евровидении – это наладить связь с каждым из 200 миллионов людей, которые будут смотреть конкурс. Она посетят некоторые промо вечеринки в апреле, но не знают, смогут ли они как-то повлиять на результат. "Думаем, что всё зависит от вечера финала и от выступления на сцене". К этому моменту они ещё не успели прослушать все другие участвующие композиции, всего лишь некоторые из них. Помимо подготовки к Евровидению, Mørland также в настоящее время работает на своим дебютным сольным альбомом. "У меня есть своя собственная студия в Осло, где в настоящий момент я провожу большинство своего времени (когда не делаю какого-то промо для Евровидения), работая над продюсированием своего первого сольного альбома. Я с нетерпением жду его выхода. Он уже более-менее приобретает очертания, я уже написал несколько песен, которыми очень доволен. Что касается жанра, то скорее его можно определить как очень вдохновлённого британской поп-музыкой, как и вся моя музыка. Я очень долго прожил в Великобритании, и я также вырос на британской музыке - она у меня в крови". Со своей стороны Дебра говорит, что также работает над своей собственными песнями с двумя очень талантливыми музыкантами из Осло. "В моих планах после Евровидения выпустить композиции, написанные мною самой, выпустить несколько синглов. Мы с Mørland также планируем дать несколько совместных концертов в течении лета, на которых прозвучат некоторые из его песен, и некоторые из моих. А уже после всего этого посмотрим, что дальше…". Будут ли новые дуэты? "Вполне возможно. Мы ещё это не обсуждали, но как говорится, следите за рекламой!" "Привет друзья! Я надеюсь, что вам понравится конкурс Евровидение этого года! Мы сделаем все от нас зависящее, чтобы произвести на вас впечатление! Если вам нравится наша песня, то следите за нами в Facebook (Mørland, Дебра Скарлетт), Twitter (Mørland, Дебра Скарлетт) и Instagram (Mørland, Дебра Скарлетт)"
С полным текстом этого интервью (на английском языке) вы можете познакомиться на странице ОГАЕ Остальной мир в Facebook. В этом году телеканал NRK вновь будет транслировать превью-шоу "Addresse Wien", где жюри из известных личностей, оценит песни, принимающие участие в конкурсе Евровидение. Новый ведущий программы - бывший член жюри Тарьей Стрём, барабанщик группы Datarock. В этом году "Adresse" будет состоять из 4х программ, которые начнут выходить в эфир по субботам, начиная со 2го мая в 19:55, на телеканале NRK 1. В составе превью-жюри в этом году Тор Эндресен, участник ряда конкурсов Евровидения и национальных отборов, Бертина Зетлитц - поп-исполнительница и автор песен, Ингеборг Хелдал - педагог и журналист side2.no, Виви Стенберг - музыкальный директор MGP, покидающая свой пост по окончанию этого сезона, Линда Эйде - писательница и журналист и Гисле Стокланд - редактор и владелица сайта 730.no. Смотрите программы в записи: 1е шоу. Смотрите видео со съемки второй части визитки Норвегии в Австрии здесь. Mørland и Дебра Скарлетт приняли участие в ток-шоу Lindmo на норвежском телевидении. Среди других гостей программы был шведский сурдопереводчик Томми Кронг. Запись шоу (интервью на норвежском) можно увидеть здесь, начиная с 26 минуты. Вскоре после победы на национальном отборе Mørland и Debrah Scarlett приняли участие в онлайн-конференции на вебсайте NRK. "Мы продолжим работать над презентацией. Но мы хотели бы, чтобы весь фокус сохранился на музыке. Часто, особенно в контексте Евровидения, сценическое шоу полностью затмевает самое важное - саму песню. Мы решили принять участие в MGP потому что мы любим музыку и хотели бы использовать возможность показать себя в качестве артистов. Музыка всегда будет оставаться нашим основным фокусом, но мы постараемся подгтовить волшебное выступление для Вены. Мы продолжим развивать тот имидж, который мы уже создали, и сделаем его более четким. Мы думаем, что это может выглядеть достаточно эффективно посреди всех этих дымовых завес и прочих блесток, свойственных подобным шоу. Мы скоро предпримем вместе с командой телеканала NRK мозговой штурм на эту тему, и, уверены, что найдем новые идеи!" Среди прочего, было отмечено, что дуэт хотел бы использовать звучание оркестра Kork, который играл на финале MGP, в конкурсной версии своей песни. Ответ на этот вопрос станет известен в четверг, после встречи с командой NRK. В одном из радиошоу также было упомянуто, что первоначально исполнение песни на MGP было предложено Силье Нергорд и ее мужу Хейне Тотланду, но они отказались от подобного предложения. "Поступило большое количество заявок от более-менее известных стран, в которых развито музыкальное направление, таких как Швеции и Великобритании. Однако, поступили и треки из менее ожидаемых стран, в которых, в то же время сохраняется довольно высокий интерес к конкурсу Евровидение, таких как Австралия и США. Процент песен, подпадающих под привычные стили поп или электроника в этом году несколько больше, чем раньше. Но больше всего я довольна тем, что интерес к конкурсу проявили одни из самых лучших композиторов нашей страны и ряд интересных новых артистов"
В этом году на отборе не будет проводиться голосования жюри, будет проведено два раунда телеголосования, лучшие 4 исполнителя, набравших наибольшее количество голосов в первом раунде выйдут в т.н. "золотой финал". Дорогой, кто я для тебя?